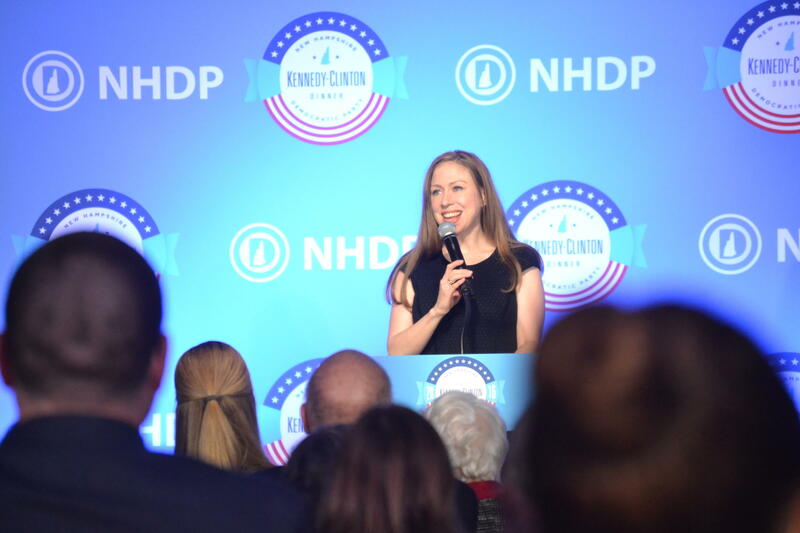 Over the weekend, Chelsea Clinton urged N.H. Democrats to make final push these next few days. Top Democrats in the state gathered in Manchester this weekend to get fired up for the election’s homestretch. At Saturday's inaugural Kennedy-Clinton Dinner, speakers included candidates for major office, with special guest Chelsea Clinton. Although the mood was optimistic, the message was clear: the fight to get Democrats elected up and down the ticket is not over. Every speaker who took the microphone encouraged the more than 800 people in the room to keep knocking on doors and making phone calls during these final days. Sen. Jeanne Shaheen asked everyone in the room to go the extra mile this week to secure Democratic seats both up and down the ticket. Chelsea Clinton, daughter of presidential nominee Hillary Clinton, made her own request. “I’ll ask you to just drink as much coffee as possible to keep yourself hydrated. To not feel badly if you subsist on sugar as I plan to do for the next ten days," she said as the room burst out in laughter. Chelsea stressed how crucial the final days in New Hampshire are by pointing to her father’s presidential campaign back in 1992. “So I know that exceeding expectations can matter because it certainly mattered for my father here 24 years ago,” she said. Over the weekend the Clinton campaign canvassed across the state with both elected officials and Hollywood stars such as Law and Order’s Sam Waterson. Back in Manchester at the party’s supper, there was one particular message that seemed to excite the crowd the most. That’s electing the first woman president. 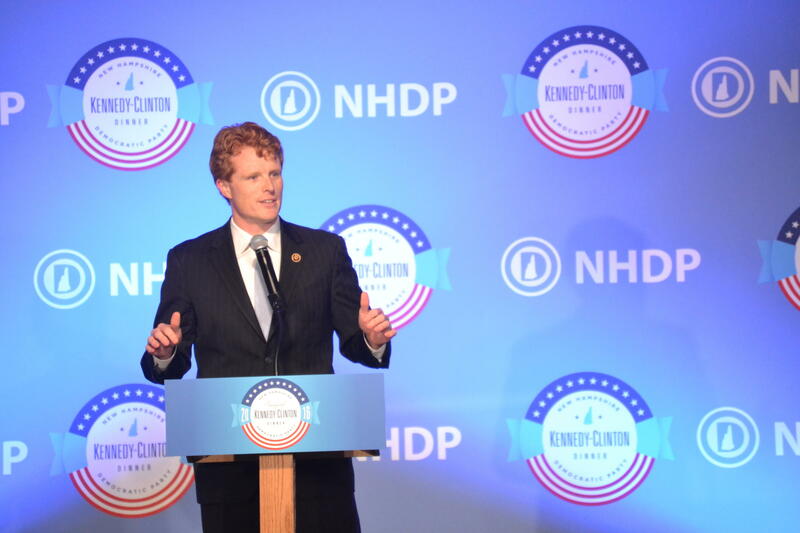 Massachusetts Congressman Joe Kennedy focused his remarks on the work ahead to try to bring the country together on Nov. 9th after this divided election. 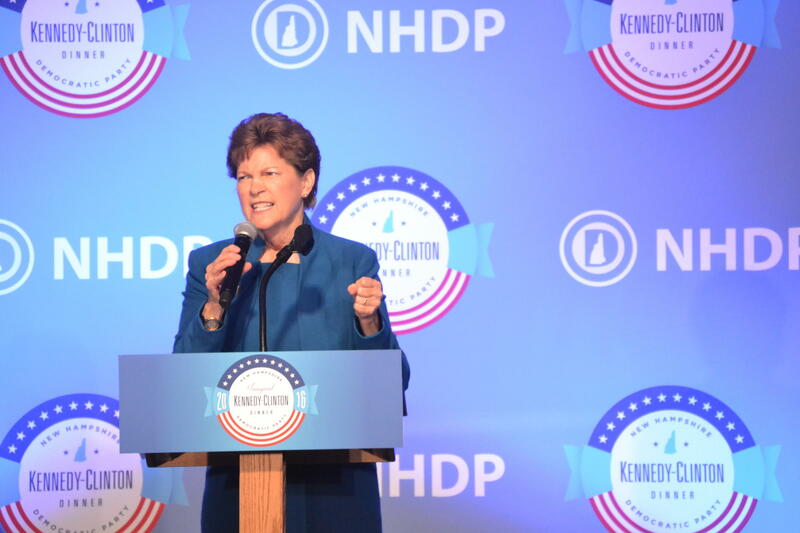 Senator Shaheen compared the significance of next month’s election to the historic World Series between the Indians and the Cubs and the two team’s long history of losing. “There’s an even longer drought that we can end on November 8th – a 227 year drought because that is how long we have gone without electing a female president,” she said. As the dinner wrapped up and people headed towards the exits, many of the guests didn’t leave empty handed. In hand were new campaign signs to stick in their yards for the final stretch. 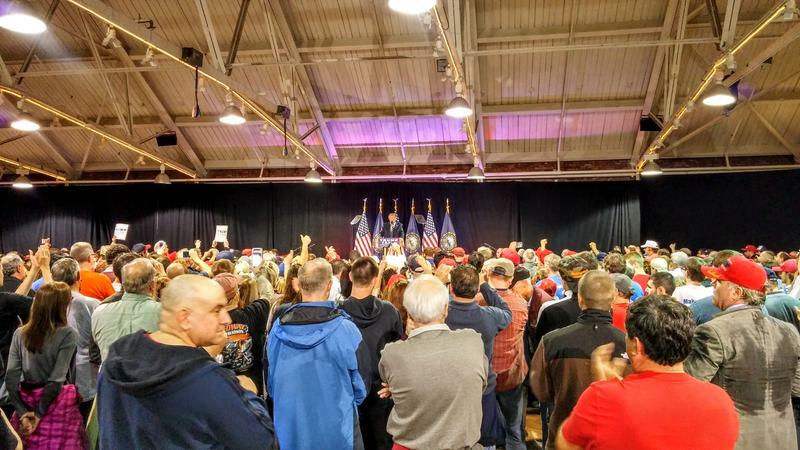 Donald Trump’s rally at the Radisson in Manchester was scheduled to begin at noon. But the fact that he was running more than hour and a half late may have actually worked in his campaign’s favor. 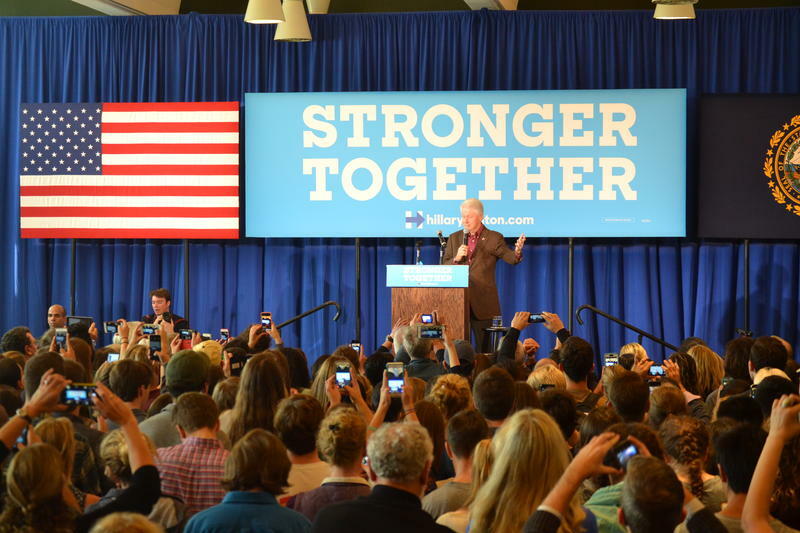 Former President Bill Clinton campaigned for his wife Hillary in New Hampshire on Monday. 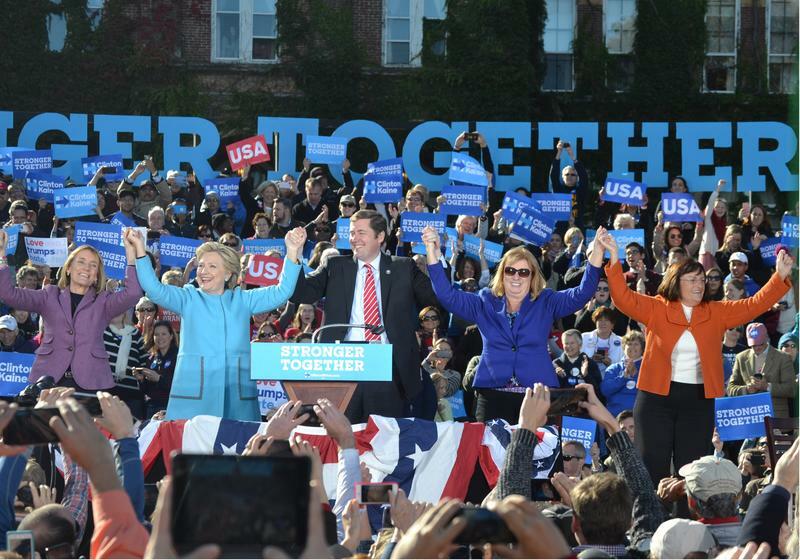 At his first stop at Dartmouth College, he stressed that America’s future remains bright.